Here at our house, my children and I close each day with a meeting where we discuss plans, dreams, needs, wants and anything else we have on our minds. Attendance and participation is not some regimented requirement - it's an opportunity for everyone that we all enjoy. I find it especially useful as it allows me to keep a finger on the family pulse, and acknowledge good behavior and personal accomplishments. I believe that it is far more important, and effective, to recognize and reward the behaviors in our children that we wish to encourage, than bashing and berating them for their mistakes. During a recent meeting, it occurred to me that my five year old son Ryan had been honest with me for quite some time. 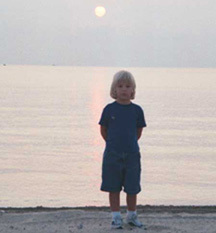 It's hard for little children to tell the truth - sometimes, it can be virtually impossible. Although Ryan is not the oldest of my little guys, he was the first to recognize that honesty, in our home, is always the easiest way out of trouble. I really did not know precisely when Ryan had last lied to me but, allowing myself a certain degree of artistic license (parenting is an art form), I announced during our meeting that it had been exactly a year. Think about that from the perspective of my children - "I wonder what else Dear Old Dad is keeping track of?" I informed my children that Ryan and I were going to do something special in recognition of that anniversary - just he and I together. When I said that Ryan and I would be hitting the road at 4:00 AM, it was clear that my children thought that I had "lost it," but I assured everyone that I had a wonderful plan. We actually left Naples a little behind schedule at 4:30 that morning. As we hit the Interstate, the night air was just a little warm, the exact temperature God meant for convertibles. Within minutes, we were cruising eastbound in the Mr. Mom Mobile (see plate) on that isolated stretch of interstate highway between Naples and Fort Lauderdale - more commonly known as "Alligator Alley." 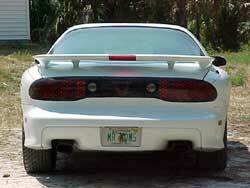 Alligator Alley is the seventy mile stretch of asphalt that traverses the Everglades. 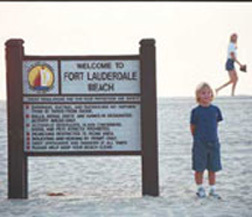 It is an uncommon section of Interstate in that there is nothing there except an off-ramp at US 29, and another at the Indian Reservation as you are approaching the Fort Lauderdale side. As desolate as it is, it is certainly much better than it used to be up until a few years ago when it was a poorly maintained two lane road - until recently, there wasn't even a rest area. It was a crisp, clear night. Within minutes the glow from the lights of Miami could be seen on the horizon a few points south of the distinctly separate glow generated by the City of Fort Lauderdale. Driving across the Alley through the Everglades at that time of night with no traffic, and no noise but the rhythmic drone of a high performance engine and the whistle of the wind, reminded me of what it used to be like to run "go-fast" boats down the Intracoastal Waterway. That was "once upon a time," in the hey day of SW Florida drug smuggling when there were no speed limits and few idle speed zones. I had expected him to sleep in the car but he was wide awake. It was obvious that Ryan was excited to see what I had planned. It was a pleasant drive, with wonderful company and there was no, "are we there yet" in our conversation. In actuality, we were on our way to what may be one of the most common of all events - a sunrise in Fort Lauderdale. While I suppose it may seem a bit odd to drive all the way across the state to see the sun come up, sunrise is spectacular from the beach as the colors break the horizon and spill over the water. It never seems to look exactly the same way twice and I don't think I could ever get tired of seeing it even if it did. By 6:15 AM, we were on the beach in Fort Lauderdale. With civil twilight a half hour away, I had just enough time to unpack the blanket, thermos and cups I had brought. 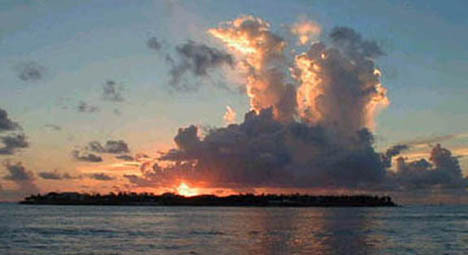 "Civil twilight" is a term common to aviators and navigators. It refers to the time when the sun is positioned precisely six degrees below the horizon and begins to light the day. It is a wonderful time to sit on an empty beach with a friend. I had tried to think of everything - I truly believe the glory of any undertaking is in the details. After outlining the options, I served up homemade hot cocoa with honey while I opted for the gourmet Hawaiian coffee with a splash of Kahlua. The diffuse glow on horizon found us on a lonely beach in Fort Lauderdale (at the end of 17th), close and comfortable on a blanket, enjoying each other's company, sipping warm drinks and crunching on those ridiculously expensive European finger cookies I hate to admit that I like. In anticipation of sunrise, the world got brighter and we could see the things around us. Surprisingly, there were very few people on the beach. I suppose the most spectacular of events can grow to become mundane for those who see them everyday. Perhaps it's not worth it to the locals to get up that early or it may be that most people are so busy trudging through lives they are not all that happy with, that they don't take the time to see what goes on around them. I don't know, but to me it was worth the trip. By 7:15 AM, the sun was up, the show was over and the world around us seemed to wake, move around and begin to make noise. We returned to the car and drove to have breakfast as we had a little time to kill. By 9:30 AM we were on the road again, southbound on the old coast highway toward Key West. That was not to be our first stop though. First, I thought I would try to share with my son a remarkable testimonial to love that you don't have to be an adult, or even a little bit of a romantic to appreciate. 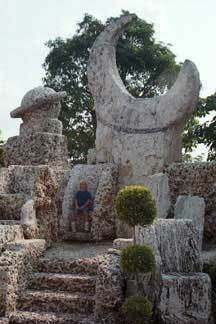 We were headed to the Coral Castle, about 25 miles south of Miami on US Hwy. 1 at 28655 S. Dixie Highway, Homestead, FL. It's a peculiar story, especially if you keep in mind that it isn't some fairy tale or script for a screen play. Sometimes, I think we all become so accustomed to TV and film that we lose track of the fact that other people are real, with hopes, dreams and ambitions just like we have. It is awfully easy to begin thinking of everyone else as bit part actors in the play that is our life. TV has taught us that everything in life takes 60 minutes to create or resolve. In 1923, a Latvian immigrant named Edward Leedskalnin came to this country after being spurned on the eve of his marriage by his betrothed, Agnus Scuffs, whom he thereafter referred to as his "Sweet 16." Ed, who was 26 years old at the time, was devastated by her rejection and he spent the next twenty years of his life building a testimonial to his love. Through his rather incredible labors, he has seen to it that Ms. Scuffs will be remembered forever. 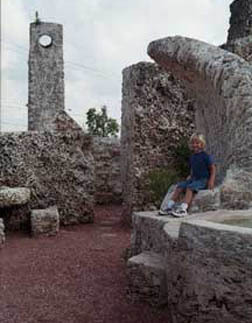 Initially known as Rock Gate Park, due to what might arguably be called it's principal attraction, it is now the Coral Castle. 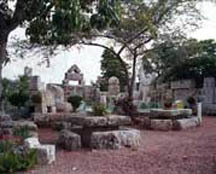 Whatever you call it, the Coral Castle demonstrates what one man could do in secret, and all by himself, when driven by emotion. 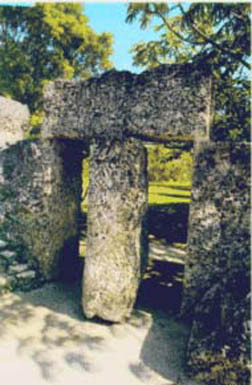 The entrance to the Coral Castle is a rock gate weighing nine tons that is so delicately balanced that a child can open it. It is a masterpiece of engineering often, but in my view unfairly, compared to the Pyramids and Stonehenge. This man's solitary work has baffled scientists for generations and created speculations ranging from sorcery to alien intervention. Why do I say unfairly? How can you compare the work of a single man, accomplished in utter secrecy, to the work of an entire cultural society? There is no record that any human being ever saw Ed Leedskalnin build anything at all. When you see what he did, the concept defies imagination. The reality of this feat is all the more remarkable when you factor in Leedskalnin's size. Ed Leedskalnin was a diminutive man standing five feet tall, weighing 100 pounds and it has been reported that he suffered from tuberculosis. 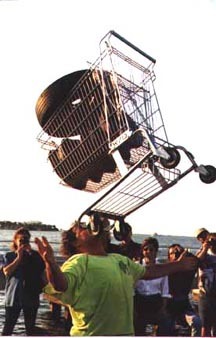 Ed was a truly remarkable engineer although he claimed nothing more than a fourth grade education. 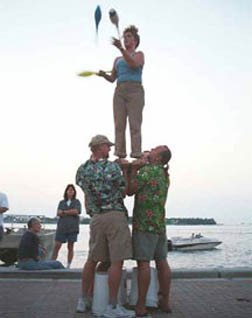 When asked how he accomplished his marvel of coral construction, he claimed to "understand the principles of weight and leverage." Considering that coral weighs about 125 pounds per cubic foot and the walls surrounding the castle are constructed of sections eight feet high, four feet long and three feet thick, one wonders how this little man moved 13,000 pounds. 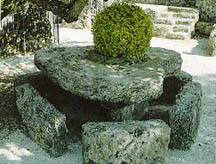 Leedskalnin furnished and appointed his home with coral structures I could not begin to adequately describe. The barbecue (upper left), the telescope (upper right), the heart shaped table (lower left) and the throne (lower right) are just a few examples. His story, and labors, ultimately ended in December 1951 when Ed Leedskalnin died in his sleep. He was 64 years old at the time. I find myself wondering what ultimately became of his "Sweet Sixteen." I wonder if Ms. Agnus Scuffs ever realized how much Edward Leedskalnin adored her, or ever knew about the remarkable romantic achievement to which he dedicated his life. Most of all, I wonder if she was really something special, or if time and emotion created something special of an ordinary girl in Ed Leedskalnin's mind. Personally, I find it interesting that Agnus Scuffs is rarely identified by name, as if her significance as a human being is an irrelevant aside to the image of "Sweet 16" as she existed for Edward Leedskalnin. We had a great time there, and we talked about the history of the place a little, but I think Ryan may not have truly appreciated the underlying drama behind all that coral sculpture. I got the distinct impression that I was conveying a bit more information than he felt like he needed. At any rate, we were both much impressed, especially with the heart shaped table. It was getting late in the afternoon so we had to hurry in order to follow my plan. Once again, we headed south on US Hwy. 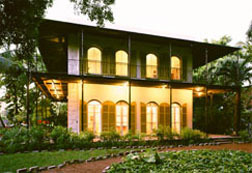 1 toward Key West, the perennial hangout of Ernest Hemingway about 160 miles away. It's ironic, or so it seemed to me, that just as Leedskalnin labored to memorialize his "Sweet Sixteen," Ernest Hemingway is reported to have written, A Farewell to Arms in memory the nurse that cared for him, saved his leg, loved him and rather brutally dumped him - her name was Agnes too. As we cruised south to, and through, the Keys, we certainly followed a much different path than Ponce de Leon and Antonio de Herrera did when they set sail in search of the illusive Fountain of Youth and discovered Key West. Their day was Sunday, May 15, 1513; our Sunday was almost 500 years later. As we left mainland Florida and cruised into Key Largo, the first of the Florida Keys, Key West seemed like a long way ahead. 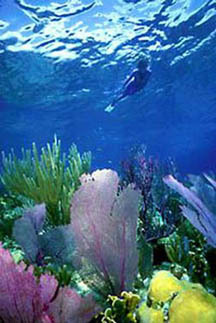 With the underwater John Pennekamp Coral Reef State Park, the Florida Keys National Marine Sanctuary, the crystal clear water at Molasses Reef, and the caves of French Reef close at-hand, Key Largo is known as the Diving Capital of the World. Once we passed through Tavernier, the highway began a long, slow curve in a westerly direction as it took us through Plantation Key and Islamorada. Islamorada gets it's name from the fact that it has a purplish appearance from a distance - the Spanish explorers called it the "purple isle" (isla morada). Just as Key Largo claims to be the diving capital of the world, Islamorada claims to be the "fishing capital of the world." As we headed south from Islamorada on the Florida Keys Overseas Highway, a series of 42 bridges that carried us from key to key, our next major stop was Marathon. Marathon boasts the conveniences of a modern community including a hospital, shopping plazas and the only commercial airport between Key West and the mainland, but it retains the charm of its roots as a 19th-century fishing village. 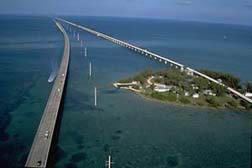 Seven Mile Bridge, which begins just south of Marathon Key and runs to Bahia Honda, is reputed to be the longest segmented bridge in the world. I don't know about that, but it is certainly a dream to drive across on a beautiful day in a convertible. The end of Seven Mile Bridge marks the beginning of the area known as the Lower Keys. As you begin the trek southwestward toward Big Pine Key, you've come about two-thirds of the way. As you can see from the map, it's a long stretch of water to drive across. 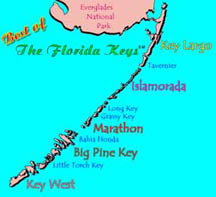 The Lower Keys were sparsely settled in the early to mid 1800's. Mosquitoes and the lack of any particular way of making a living made it difficult to homestead this area but a few pineapple farms flourished and a large pineapple factory was built which furnished canned pineapple to most of eastern North America. 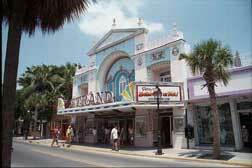 During this time period, Key West had a population of 18,000, making it the largest city in Florida. A playground for the rich, it was also the most affluent city in America. In 1912, Henry Flagler completed his Overseas Railroad making it possible to settle the Lower Keys. The train ran from its completion in 1912 until 1935 when the great Labor Day hurricane destroyed it. The railroad left many remnants of its existence in the Lower Keys. Water towers, sumps, sinkholes and sections of the railway bridges are still evident. 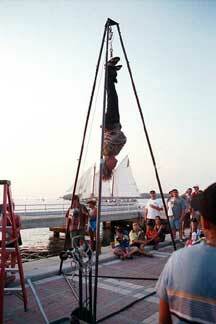 Big Pine Key was once the site of a shark processing factory that employed workers to catch sharks and skin them. The hides were salted down and sent north to the home factory in New Jersey where they were processed into a tough leather called shagreen. As we cruised south through Big Pine Key, Summerland Key, the Big Torch and Little Torch Keys, Cudjoe Key, Sugarloaf Key and Big Coppitt Key, Key West got closer and closer. Key West, the home of the Little White House and the Hemingway House is a collection of tourist attractions but they were not the reason we had come. 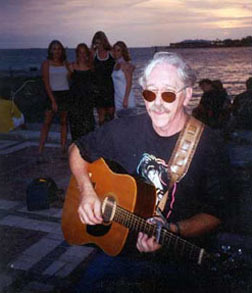 We came to see Mallory Square, the world famous center of Key West's waterfront best known for it's Sunset Celebration. There's nothing going on there until sundown though - we came to see the town. 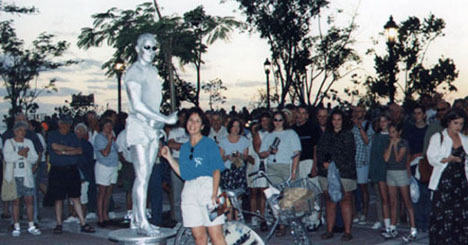 Our first stop was Ripley's Believe it or Not on Duval Street. As you walk in past the two-headed calf, you know it's no ordinary place. I had never been to Ripleys, so I didn't know what to expect - I was impressed but parents might want to review the place before taking young children. Nothing there bothered Ryan though. 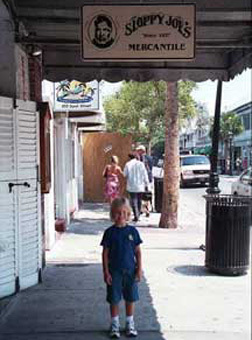 As we walked down Duval Street, Ryan and I encountered a scene common to all old city neighborhoods. One of the local drunks apparently took exception to something a police officer said or did and his semi-coherent ravings created something of a spectacle. Ryan was not entirely sure what to make of it and, whatever happened, I knew it would give us something to talk about so we stood by and watched. Officer Bradford was a really tall guy - I guess when you're that big you must be careful whacking on people even when they really need it. 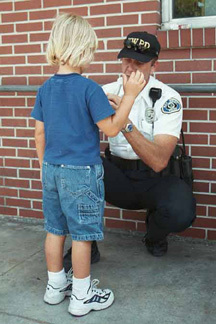 Although it would have suited me just fine to have Ryan learn that adults can be spanked too, the officer was patient beyond patient and Ryan got a great lesson in self control. Whatever the Key West PD is paying, it isn't enough. After dealing with Baron von Barroom, the Lord of Libation and Heir Apparent to the Porcelain Throne, the officer shuffled around in his car a minute and walked over to talk to Ryan. Ryan isn't scared of policemen but this gentleman is uncommonly tall; I could tell Ryan was just a wee bit uncertain he wanted to talk to him. It was a solemn event; I certainly was impressed at the gravity of Officer Bradford's demeanor as he swore Ryan in. Ryan promised not to get involved with drugs, disobey his parents, smoke cigarettes and various other things - before I knew it, Ryan was sworn in and wearing a badge. Off we went to celebrate and where better than Sloppy Joe's Bar?! I was surprised to see the price list - since Sloppy Joe's is known as the place Hemingway liked to hang out, and the one bar anyone is likely to be able to name in Key West, I expected a tourist trap. The prices were reasonable, the service was great, the chicken strips were as good as any we'd had and, unlike "Billie's" down the street, they didn't charge me for another drink every time Ryan needed his cup refilled. It was a great place to relax until sundown. 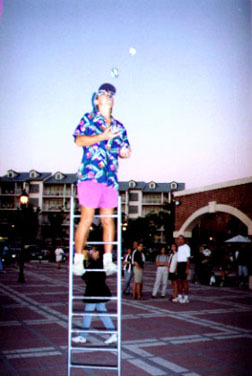 The Sunset Celebration is a daily event of spontaneous entertainment provided by street performers. In an unchoreographed, disorganized, display of talent and curiosities, these artists create an atmosphere akin to that of Bourbon Street. 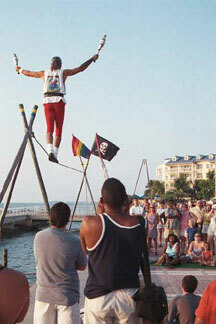 On any night of the year, those who come to Mallory Square a couple of hours before sunset find; jugglers, tight rope walkers, trained animals, fire eaters, escape artists, singers, human statues and a variety of other performances calculated to amuse and enchant them. There is no charge and there are no tickets; the talented perform for the sake of performance and the crowds contribute tips to the extent that they feel is justified and appropriate (or they are supposed to). It's an incredible spectacle of entertainment gone completely out of control. 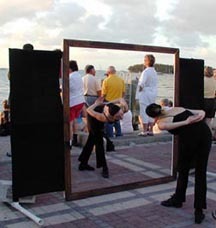 There was so much to see; the performers were all very considerate of one another (and the crowds) by waiting until one artist was finished before another began their act. It was entertaining, for young and old alike - it was sad that so many people watched the acts, and walked away when the performers "passed the hat." Ryan and I talked about that a bit. I think parents should talk with their children - not talk at them but really talk to them and exchange some thoughts. I found it particularly rewarding to listen to what Ryan said, and see how his five year old mind worked. I don't think it would have occurred to him had I not brought the issue up, but once I mentioned it, he didn't think it was fair for people to watch acts they couldn't, or wouldn't, pay for. I don't try to tell my children what to think, I see no point in that. We watched the performers, and the crowds and lessons were learned from both. I gave him a handful of dollar bills and left it to him what he should pay, and to whom. At a little distance, I stood and watched my son as he marveled at the magic he saw. 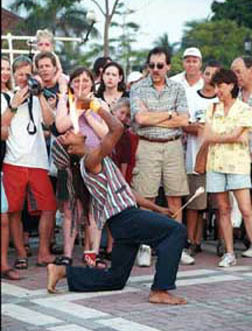 With each performance, he was enthralled as only a child can be. I also saw him watch people as they walked away, and I could see that he thinking about the things we discussed and was proud to contribute his money, and pay his share. The thing I found most fascinating was Ryan's decision when his money ran out. 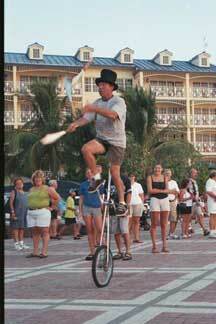 He was down to his last two dollars as he watched the man on the unicycle and it was clear he really enjoyed the show. "The Immigrant," as he called himself, was funny, clever, talented and loud - it was a really good performance. 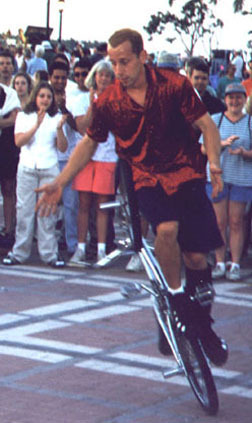 Although Ryan had given most of the other performers two dollars, and some of those that weren't as impressive just one, I expected him to give the cyclist a single dollar so he could have money left to pay to watch another act. Instead, Ryan gave him his last two dollars and then walked over and thanked me for bringing him. I wish I could share with you that feeling as we walked to the dock to see the sun go down, as I held the hand of my five year old, knowing he will one day grow up to be the kind of man I will be proud of. Does life get any better than that? As we sat together and watched the sun set, bringing our day to a close, I thought about the first time I had recognized that a state with east and west coasts offered a unique opportunity to see the sun rise, and set, over the water. It was a troubled time for all of us back then, and I thought I saw in this a marvelous potential. There are times in life that things can become so terribly messed up that the effort to forgive and forget is self defeating, serving only to dredge up that which must be left forgotten. It seemed to me that the salvation of our relationship depended upon putting the past behind us, and setting out together again, resolute in joint agreement never to look back. How, exactly, do you do that; how do you clear the decks, close the books and start with a clean slate? I didn't know, but I thought about it a lot back then, and it occurred to me that two people who desperately needed a new start, and a fresh beginning, might set out on a personal pilgrimage to witness the dawning of their first day together on a lonely beach, inviting the rising sun to pierce our personal gloom and wash away the darkness in our lives, just as it had for all the world since the beginning of time. I visualized a dramatic fresh start, a new day, where we might follow the sun across the sky, discovering one another again against the backdrop of a wonderfully romantic experience, celebrating our promise and potential, until we arrived upon another beach, on another coast, and put our day to bed. With so much at stake, it seemed to me that if it was important enough, if we wanted it badly enough, we might thus create our own special day, resolved that it would be a foundation for our future and serve to set the standard for every day to come. I cannot say if it would have worked or not; I can't say that we tried. This particular trip marked no effort to resurrect a relationship; instead, it served to cement one, strengthen it and underscore the importance of honesty within our family. Honesty is so important in all relationships. I hope you enjoyed sharing our little trip with us. It was a truly memorable event between father and son - One Single, Perfect Day.